The leader of France's controversial far-right party will be in the province for nearly a week, but none of Quebec's party leaders are planning to meet her. Premier Philippe Couillard and provincial opposition leaders are keeping clear of the controversial leader of France's far-right party, the Front National. Marine Le Pen is arriving in Montreal today and plans to spend six days in the province. During her time in Quebec, she will hold news conferences in Montreal and Quebec City. She'll also travel to the French self-governing territory of Saint-Pierre and Miquelon, south of Newfoundland, and hold a news conference there. Premier Philippe Couillard, Parti Québécois Leader Pierre Karl Péladeau and Coalition Avenir Québec leader François Legault have all declined to meet her. Marine Le Pen has been criticized by many in France for what are seen as thinly veiled racist positions. 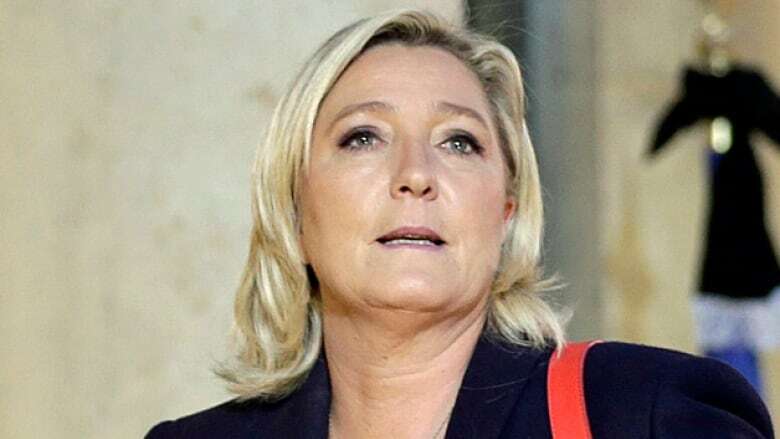 However, the Front National, a one-time fringe party founded in 1972 by her father, Jean-Marie Le Pen, has gained popularity under her leadership. She has her sights set on the 2017 presidential election and has been striving to clean up the party's image. Monday: Quebec City and Montreal. Friday: Saint-Pierre and Miquelon, then back to Montreal.